Leader of the Batkivschyna Party Yulia Tymoshenko, during her visit to the U.S., has discussed with the Senate Intelligence Committee member Joseph Manchin the escalation of the Russian aggression against Ukraine, in particular the recent events in the Kerch Strait area. They also spoke about the situation over the introduction of martial law in the Ukrainian state, the press service of the Batkivschyna party said on Friday. 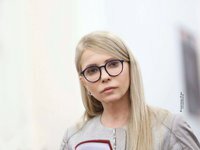 "Tymoshenko called for the strengthening of sanctions against Russia and stressed the need for negotiations in the "Budapest plus" format with the leaders of the signatories of the Budapest Memorandum and with the involvement of the EU High Commissioner and the German leaders," it says. The meeting was also attended by deputy head of the Batkivschyna party, head of the Verkhovna Rada committee on human rights Hryhoriy Nemyria and chairman of the Rada committee on state-building, regional policy and local self-government Serhiy Vlasenko.